Tibet, a Buddhist country, has successively [seen] several Phyi gling foreigners, who arrogated to themselves many names, even illicit ones; and at various times there was a talk of their penetrating into Tibet. [But] it is the rule that suchlike persons should never at all enter Tibet. And therefore the ruler and the ministers of Tibet (Tangut) and all the people, monks and laymen from the past generations till the present have taken and sworn a sincere voluntary covenant to prevent [the entry of foreigners] at the risk of death. Upon this matter they are resolute with full knowledge of the facts. This statement, made by the Kashag in 1879 on the occasion of the proposed journey to Tibet by the explorer Przhevalsky, contains all the elements that go to make up the nineteenth to twentieth-century Western picture of Tibet, namely the xenophobia and self-imposed confinement and internment that characterize Tibetan culture and politics. The attitude expressed here is of great significance, because the statement comes from the Tibetans themselves and not from foreigners. However, both this self-image and its foreign counterpart depict merely one preliminary moment, one move in the final stage of the dialectical process that developed in Tibet’s encounter with European powers and China; and these “typical Tibetan characteristics” took form in Tibet’s contacts with both China and Europe. To return to the quotation at the beginning, the prototypical description of self-confinement is in itself rather striking, but the statement that self-confinement has always been an aspect of Tibetan society is particularly remarkable. This statement is historically inaccurate. It reflects the fact that to legitimize history, a tradition was invented to explain the actions of 1879. History here is being written backwards in order to justify the present situation. Actually things were different in the previous century. In the years 1707-1745, Tibetans and Europeans were able to form a continuing relation over the course of several decades – although this was the only time such a long-term relationship occurred. Extensive documentation in both European and Tibetan sources al­lows us to reconstruct the images concerning the “other” on both sides and discern their gradual change. In the first half of the eighteenth century, no self-confinement or isolation was in evi­dence at all. On the contrary, Lhasa was an international city with many for­eigners from Asia, even Russia and Armenia. The history of the Capuchin mis­sion in Lhasa, as testified by a number of Tibetan documents, shows the great extent to which the European monks were granted liberty and privileges. In the course of time, however, the attitude of the missionaries caused the Tibetans to reconsider their policy toward the foreigners, which in the end led to a policy of separation. This paper, however, will mainly focus on the Tibetan context and Tibetan reactions, not on the history of the Capuchin Lhasa mission in general. This development in attitude occurred in three stages: 1707-1711, 1716-1733, and 1741-1745. The only known sources for this period stem from the Capuchins themselves, in the form of various letters together with reports summarizing the letters. Upon their arrival, the Capuchin monks were, in their own words, received hospitably by the Regent. An Armenian trader to whom they had been recommended arranged their accommodation and their introduction to the court. Although the Tibetans had initial misgivings because these monks wore strange clothes and were ignorant of the Tibetan language – they took the missionaries for "Kashmiri," fearing they had nothing on their minds but filling their bellies – these misgivings were soon overcome. The Capuchins arrived in Tibet rather unprepared. They tried to familiarize themselves with the unknown by drawing analogies with their own world and their own church and religion. For instance, they tried to establish similarities by equating the Dalai Lama with the Pope, the popular religions of both cultures with one another, the religious processions in Italy with those of Tibet. The missionaries also tried to find similarities between Christianity and Buddhism on such key points as the Trinity, incarnation and anthropogenesis. It is interesting to note that the Tibetans in return tried to understand these foreign monks by calling them European lamas. Even the Tibetan clerics approached the foreign images of their Catholic saints and places of Christian worship with reverence. However, from the outset one striking difference stood out, namely the discrepancy in attitude between the Capuchins and Tibetans toward each other’s religion. Tibetans described the Capuchins’ religion as “good” – both the Regent and Dalai Lama are reported to have expressed themselves thus – and showed religious awe and reverence towards the images and symbols of Christianity. The latter also applied to clerics. However, the Capuchins viewed Tibetan Buddhism as idolatry, superstition and heresy. On the other hand, the Italian monks won the approval of the people and their Regent for their irreproachable way of life and their altruistic practising of medicine. a) The Europeans were granted the right to reside in Lhasa, to practice their own religion and to wear their monastic garb in public “just as in Paris or Rome.” In addition to the missionaries’ medical knowledge and free medical service, which was well received even by the Regent, the Tibetans also showed interest in and respect for the Christian religion. b) This positive attitude was not limited to instances that have parallels in Tibetan customs, but included interest in natural sciences and technology. In particular the Regent, Lha bzang Khan, was attracted to persons who had knowledge of natural sciences, mathematics, astronomy, architecture and horology. It appears that the Europeans’ reputation in these domains had spread to Tibet from China, where the Jesuit missionaries were acclaimed for their multifaceted talents. Unfortunately, our missionaries in Lhasa did not live up to expectations. c) Tibetan flexibility even extended to matters of law. A Christian Armenian trader was in a lawsuit with an Indian. At one point he was forced to testify under oath. He objected to following the normal procedure and wanted to swear on the Bible, in the manner of the Christians. It is interesting to see that the Regent, who happened to be in charge of the case, entrusted the Capuchins with administering this oath to the Armenian, which was then accepted as legally valid. d) Tibetan openness did not cease with the Europeans’ departure. A local governor promised to hold the chapel, including books and medicinal supplies, in trust until their return. At this initial stage, it appears that the Regent and his court had more knowledge of the Italian missionaries than the latter had of the Tibetans. This seems to have been of some advantage to the Tibetans. Things changed, however, due to the missionaries’ willingness to learn more about the Tibetans’ society and religion in order to convert them – in other words, to change them. As a consequence of the Capuchins’ interest in Christianizing or changing the existing Tibetan tradition, they automatically assigned only negative value to the cultural topics they were studying. Although this attitude led to an intensive study of all the unknown aspects of this society and the acquisition of relevant knowledge, this knowledge did not reduce the differences between the cultures, but paradoxically enough actually increased them. Although this was a somewhat turbulent period in Tibetan history, any hypothetical consequences of the Dzungar invasion and the establishment of the Ambanate on the attitudes of the Tibetans towards the Europeans must be omitted for the purposes of this study. Compared to the first phase, the relationship between the Tibetans and Europeans underwent distinct changes. Many Italian and some Tibetan sources give the following picture of the missionaries’ activities in Lhasa during this phase: For the first time the Capuchins began to declare openly their wish to convert the Tibetans to Christianity. In consequence, the Tibetans gradually split into two parties. One side was taken by the Regent, other government officials, and some clerical dignitaries, while the other side was composed of the main body of the ecclesiastical hierarchy, which held a more negative attitude towards Christianity and began to impose limits on the missionaries’ activities. While the first group appeared to be unreservedly open to the new religion, the second increasingly attempted to draw the line against the new competitors. The dividing line between the groups, however, was not fixed from the beginning. From the sources we know in some detail about the changes in the Capuchins’ attitude at that time. The attempt to familiarize the unknown via the known developed into a kind of reverse strategy. In due course, references to similarities between the two religions disappeared, and a new emphasis on the differences between the two religions appeared. The Papal Bull by Clemens XI, translated into Tibetan by the Jesuit Ippolito Desideri, was presented together with him to Regent Lha bzang Khan at a ceremonial audience in November 1716. In this document, the Pope describes the Capuchins as “apostolic missionaries” and appoints Domenico “professore” for Tibet. The Regent was positively disposed towards the Pope’s missive. Soon after, some Tibetan clerics visited the Capuchins to discuss religious matters with them. The Capuchins responded by drafting a letter in Tibetan expounding on the existence of the one true religion. This missive was given to the Regent on the date of Epiphany 1717. He accepted it positively and after briefly scanning it, raised some objections which the Capuchins were able to refute to their own satisfaction. A lama offered to prepare a written rebuttal. After the Regent had read the letter with satisfaction, he expressed his regret that the Capuchins were not sufficiently skilled in his language to explain obscure passages to him, which he desired to have explained by the missionaries themselves instead of by his interpreters. The Capuchins thus renewed their endeavours to gain entry to a Tibetan monastery in order to learn the language and gain a better understanding of the religion. Further audiences with the Regent returned to discussions of theological issues, in which the Regent repeated his interest that the European monks might master Tibetan well enough for him to be able to hold discussions with them without the need for an interpreter. While mastering the language of the country was a fundamental principle of the Jesuit missionaries, it seems strange that the Tibetan Regent was obliged to point out several times that the Capuchins should above all learn the language. The Jesuit Desideri had begun to learn Tibetan even before his arrival in Lhasa, on the long journey from Kashmir, and mercilessly criticized the Capuchins’ linguistic abilities. Yet, Domenico da Fano had already brought a simple Latin-Tibetan dictionary to Rome as early as 1712 after the first phase of contact, although in his report of 1713 he admitted to an extremely limited knowledge of the Tibetan language. Although some monasteries had refused the missionaries’ request to learn the Tibetan language on their premises, the Regent granted the missionaries special privileges to study the Tibetan language and provided them with a monk as their teacher, who was exempted from his usual duties in the monastery. Orazio della Penna and Desideri were allowed to study at Sera monastery and even to celebrate mass within the monastery. Orazio took up the challenge, and after four years of intensive study of the language was able to translate Tibetan writings (Lam rim chen mo) and lengthy Catholic apologetics into Tibetan; he compiled the first large-scale Tibetan-Italian dictionary, with 35,000 entries, together with its Italian-Tibetan counterpart. Furthermore, both Desideri and Orazio seem to have been the first to explain correctly, and independently of one another, the significance of the formula Om mani padme hum. And the Capuchins were even the first to introduce a printing press with 1306 movable Tibetan types into Tibet in 1741.
a) Despite the missionaries' now open intention to convert the Tibetans, they were granted residence permits, tax exemptions which treated them as equal to the Nepalese, and the possibility of acquiring property. b) The Regent granted the Capuchins protection from the Chinese envoys, who wanted to force the monks to return with them to Peking after they had administered successful medical treatment. c) As in the first stage, not only was there interest in the foreign religion, but the Regent und others still expected to obtain from the missionaries access to the products, knowledge and abilities of their foreign culture, in fields such as optics, telescopes, thermometers, water pumps, technological know-how and skills in the art of making glass and mirrors, etc. He speaks of snuff, which is not available in Tibet, and shows them gifts which he had received from foreign countries. Apart from the existing imbalance in the level of mutual esteem accorded by the two sides, the relationship now underwent a further change with regard to their knowledge of each other. The Regent, on the one hand, was interested not only in the foreign religion, but also in other aspects of the foreign world’s material and spiritual culture. On the other hand, the Capuchins were restricting their contacts with Tibet to the religious realm. The missionaries’ shortfalls in knowledge and skills, already manifested during the first phase, were not made good but allowed to continue. The Capuchins did not even consider that the interest expressed by the Tibetans could be satisfied by other members of their own culture. On the other hand, the Regent was also not interested enough to undertake more decisive steps to obtain relevant objects or knowledge of non-religious European culture. While the Capuchins were interested in gaining as extensive and unhindered access to Tibetan culture as could be useful and important for their missionary goals, they permitted only limited access to their own European culture by restricting the all-important exchange between their peoples to the realm of the purely religious. We can summarize the situation in the first stage of the second phase as follows: The Capuchins regarded the Tibetans primarily as heathen that had to be converted. For the Tibetans the Capuchins were physicians, unbelievers and members of a different faith whom they had no desire to convert, and representatives of a distant, and in some aspects interesting, culture. It is interesting to note that the missionaries generally discussed religious topics with secular officials, while the Tibetans vainly sought information from the Europeans on secular topics such as technology. The Capuchins had little contact with Tibetan monks, and vice versa. While the Capuchins produced a wealth of written material on their activities, Tibet and the Tibetans, they were mentioned only twice in Tibetan writings throughout all three phases of their mission. The invasion of the Dzungar Mongols destroyed all previous successes achieved by the Capuchins. The hospice was plundered and the missionaries maltreated and compelled to hand over their funds. They were forced to flee Lhasa or go into hiding. The Armenian and Russian trading colonies left the city, thus depriving the Capuchins of the support of which they had availed themselves repeatedly in the past. Far more significant was that their supporter Lha bzang khan was murdered by the Dzungars. In a letter of May 28, 1718, Domenico da Fano again summarizes the history of the mission from its second arrival in Lhasa in 1716: Initially favourable developments improved still further, and the conversion of the Regent – and with him the people – seemed within their grasp. And then a bolt from the blue, the unfathomable will of God, destroyed all that had been achieved and even abandoned the monks to the cruelty of the invaders. But hope, in the form of the Chinese army, was not far away. In the meantime, God used the new ruler as an instrument to inflict damage on the Tibetan religion and to bring the missionaries’ work further and more rapidly than the “poor” missionaries could have achieved in years of hard work, The Red Church was persecuted by the Dzungars, its statues, images and books destroyed. But the Yellow Church was also affected and its monasteries subjected to a type of “cleansing”. Giuseppe Felice supplies a different interpretation of historical events in Tibet from that of Domenico, viewing the political unrest in Tibet (as in Nepal) as a sign of the Devil’s activity at the coming of the Italian monks. As time passed, however, a certain normality returned to relations, and the Dzungars even sought medical assistance from the Capuchins. The following example also demonstrates the openness and esteem of the Tibetan clergy: When the Capuchins requested an audience with the Dalai Lama they were not required to take part in religious worship of the Dalai Lama, i.e., the Tibetan did not insist that they offered prostrations. The chamberlain (mgron gnyer) asked them whether they wanted to worship the Dalai Lama as the others did. They answered they wanted to revere him as a king but not adore him as a god. Their wish was respected, and during the audience the Dalai Lama suddenly drew back his hand, electing not to touch their heads (the traditional clerical blessing of the clerics). During the audience the missionaries were treated with all honor and were ranked under the cabinet ministers (bka blon). In the mid-1720s, the Capuchins received an extension of their exemption from taxes from the new government. They acquired a piece of land for a nominal price on which they could build a convent and a church, and they were also granted exemption of taxes for their building. The missionaries were given building material and man-labor. In the document of 6 November, 1724 the 7th Dalai Lama states as his reason for granting these favours that these “white-headed lamas” had come to do good to sentient beings. It is interesting to note that the bill of sale was not concluded by the Capuchins, but by Pope Innocence XIII and the Dalai Lama. These positive events, however, were marred by some friction between the Capuchins and some Tibetans. In 1725 the Kyichu river overflowed its banks and caused a great flood. The Capuchins were blamed for this because they had built their church. According to the Tibetan Geshe Rab 'byams pa Yon tan dpal bzang, Tibetan books contained a prophecy that monks of an alien religion would come and destroy Tibetan Buddhism. The omen would be the building of a church and a flood, and the only way to prevent disaster was to destroy the church and expel the foreigners. When the catastrophe occurred, the people, aware of why the Capuchins had come to Lhasa, recalled this prophecy, which was also spread by soothsayers. The people’s antagonism towards the Capuchins was whipped up into a riot in which both Tibetans and non-Tibetans participated. At the recommendation of the master builder, the Capuchins showed the crowd the document from the Dalai Lama. The crowd fell back. This procedure was repeated. Finally the crowd turned to a variety of oracles in their attempt to find out the true cause of the flood. One of these oracles confirmed that the construction of the church was the reason for the flood, as the prophecy had already stated, and that consequences would be necessary. The crowd made a third attempt to stop the building, but were again forced to retreat by being shown the document from the Dalai Lama. After these fruitless attempts, the “people” turned to the state ministers and “elders” of the city, who ordered that the traditional prophecy and oracles should be obeyed. As soon as the Regent heard of this, he sent a courtier to the Dalai Lama to hear the latter’s verdict. The Dalai Lama replied that he believed it was right not to destroy the monastery of the white-headed monks and not to disturb such good people that had come such a great distance, or bring them grief. However, should the people persist in their revolt and should the Ministers of the State decide against his will, he believed it was right to reimburse the Capuchins’ financial outlay or offer them larger premises as compensation. Under no circumstances should the padres be expelled from the country. The Regent informed the State ministers of the views the Dalai Lama had expressed in this statement, and the ministers rescinded the decisions already made and declared their intention of reconsidering the problem in more depth. In the meantime the banks had been reinforced with new dams, so that the floods ceased. Compared with the Tibetan description in the biography of the 7th Dalai Lama, the Capuchins’ sources seem somewhat one-sided. For example, they make no mention of the exceptional preparations against the dramatic flooding taken by the Tibetan clergy (consulting the Nechung oracle, ceremonial setting up of statues of Buddhist divinities on the riverbank and on the roof of the Dalai Lama’s palace). The Capuchins also failed to mention the explanations given for the waters receding. However, Gioacchino’s report contains an episode unmentioned by Orazio: When the crowds were ordered by the “State governor” to tear down the building under construction, the Dalai Lama’s father intervened. “He immediately sent a countermanding order that what had been built should not be demolished but that the material stored there for building should be used as protection against the floods mentioned …”  Replacement materials were promised, and later lavishly supplied. A cautious interpretation of this passage at least permits the conclusion that the attempted demolition of the Capuchins’ premises was spurred by not only religious motives, but also highly pragmatic ones. Material was needed to construct a dam against the river that had burst its banks. Both the ecclesiastical and secular elite, however, sided with the missionaries. There were also rumours deriving from Indians that the Capuchins were merely the vanguard of an European invading army. The attitude towards the Capuchins had changed; the foreigners were perceived as a threat. To summarize the conflict that arose in connection with the building of the church and convent in Lhasa, on the Tibetan side there were two distinct parties: the townspeople of Lhasa, including oracles, who worked towards the destruction of the buildings and the expulsion of the Capuchins. The other party, which included the Regent, the Dalai Lama, and his father, worked toward protecting the rights granted to the Capuchins years earlier. It is interesting to note that neither the monasteries nor their representatives were yet involved. Although after another court case both the Regent and the judges were fully aware that the foreign monks belonged to a different religion, no negative judgment resulted. Instead, they believed it was possible to coexist, because the foreign religion appeared to be “good.” The townspeople of Lhasa, however, were more perceptive in concluding that these foreigners only came to Tibet to destroy Buddhism, and ought therefore to be expelled and their buildings destroyed. However, the conflicts over the construction of the Catholic church and the hospice in Lhasa did not end with the completion of the buildings. Around a year after building was completed, in 1726, the “people” brought a court action against the Capuchins as propagators of a new religion contradictory to the Tibetan religion. The monks were summoned and cross-examined, after which Tibetan religious authorities examined their catechism. The verdict of the judges was that the Catholic religion was found to be good and holy, and the people were ordered to cease obstructing the Capuchins in their propagation of their religion. Furthermore, the verdict described the Christian religion as more effective than the Tibetan religion with regard to the salvation of the soul (sic!). The discussion of the true religion between Capuchins and Tibetan monks. Gradually a new situation emerged. The Capuchins began to contact representatives of the monasteries. After surmounting the language difficulties, the Capuchins were now able to communicate with the Tibetans, and thus began to disseminate knowledge of their foreign religion to the Buddhist dignitaries and in the monasteries. The discussions that arose highlighted their differences. Although the Capuchins’ letters clearly refer to opposition from the Tibetan clergy, the Capuchins nevertheless revelled in their apparent success. These references appear in a few letters only, but they indicate that there was opposition, especially in the monasteries. Still, the continuing Tibetan tolerance can be deduced from the favourable reception of Orazio della Penna’s Tibetan translation of catechisms within Tibetan monasteries. One of the highlights of his work was the reading of the catechism during an assembly at the monastery of Sera. It is reported that a number of monks desired to join the Capuchin order, which was, however, impossible given the economic situation and the fact that the buildings were under construction. In addition, several “near”-conversions were reported in connection with a number of Tibetan clerics; which according to the Capuchins failed primarily because the persons involved were left with no means of support after renouncing their social and religious status and the associated necessity of leaving their monasteries. Furthermore, report was made of how well-known the name of God was among the Tibetans and that they acknowledged him as the creator of heaven and earth, that they esteemed the effect of Christian prayers against sorcery etc., that they began to doubt the possibility of reincarnation of human beings as animals, that they recounted that the “white-headed lamas” were in the process of issuing a better book than the Tibetan Lam rim chen mo! The Tibetans’ openness and exemplary difference in how they treated the Capuchins is also demonstrated in a written exchange between the Dalai Lama, or more specifically his spiritual tutor, and the Capuchins concerning basic questions of religion. The Tibetan side argued strongly, with sound reasoning but also with respect. Unfortunately the Capuchins mistook the Tibetans’ courtesy as religious surrender. Furthermore, the Dalai Lama or his representative even asked that a text from him be transmitted to Rome, in which he asked for the prayers and blessings of the Pope. The Capuchins in return did not ask the Dalai Lama for his blessings and prayers, nor did they deem it worthwhile to transmit his text to the Pope. Another incredible offer made to the missionaries in this period was made during the Dalai Lama’s absence from Lhasa from 1728-1735, when the representative of the Dalai Lama (rgyal tshab), rGyal sras Rin po che ‘Jigs med ye she grags pa,is said to have suggested that young Tibetan monks be sent to Italy to study the Italian language and Catholicism. “As a result, your excellent religion will spread easily.” In addition, the senior cabinet minister (bka' blon) was also willing to send young Tibetans to Europe. The Capuchins, however, refused this singular offer for lack of money. The fact that Tibetan reports were distorted by the Capuchins in the process of translation – as will be shown later – arouses suspicion; however, we have reason to believe that the suggestion was no mere fabulation. Anyway, it seems evident that the Tibetans at this stage tried to move more towards the foreigners and were making a cautious attempt to open themselves to the outside world. Another document states that “despite the fact that you were of no use for us, not even worth one ounce of silver, we have nevertheless protected you with amicable sympathy so that neither harm nor injustice shall befall you.” These statements ought to have shown the missionaries that there was little hope of converting the Tibetans. Surprisingly, however, contemporary Italian translations of the Tibetan documents display a careless misunderstanding of the texts. This is due to exaggerations and mistakes made in the light of their own expectations and intentions. These translations were added to the official documents as evidence. Without wishing to insinuate that open forgery was perpetrated, it appears that the Capuchins made these mistakes in the course of translating the documents due to their own highly selective perception, in which they introduced reinterpretations and distortions and ignored everything negative, exaggerating and generalizing positive aspects. Any positive word from the Tibetans was seen as approval of their missionary work, although it may in fact have been no more than a polite phrase or reference to their moral merits. The Capuchins overlooked all distinctions, contrary positions and the Buddhist interpretation of their own work. They were unable to imagine the possibility of showing esteem for persons of a different faith on account of their moral qualities, or finding and emphasizing the good in other religions, although remaining a staunch adherent of one’s own system of belief. It was inconceivable to them that the peaceful coexistence of different religions could be advocated by Tibetan Buddhism and that it did not at all reflect doubts of Tibetan Buddhism on the part of the Tibetans themselves. To sum up the second stage, it is somewhat difficult to assess the Tibetan standpoint on the basis of the documents available. It does seem, however, that just as the Capuchin reflection was based on Catholic belief, the Tibetan reflection was embedded in Buddhism. The Tibetans let the Capuchins have their way in Lhasa, although they were spreading a foreign belief. They came to meet the Capuchins and approved of the building of a church; in addition, they provided property and engaged in theological discussions, going so far as to point out positive aspects of the foreign religion. Like the Capuchins, the Tibetans tried to focus emphasis on various aspects and digest them by means of their own comprehensive terminology, but neither party admitted the intentions of the other. On January 6, 1741, after a journey of 2 years, 4 months and 25 days covering 18,381 Italian miles, Prefect Orazio and five further missionaries arrived in Lhasa after eight years of absence. However, to their great disappointment the hospice proved to be in a derelict state after their long absence. The Prefect thus turned to Pho lha nas, who, in contrast to the doubts already expressed by the new arrivals to the Tibetan mission during their journey, immediately made the necessary arrangements, so that the hospice was soon restored to the Capuchins in a functioning state. Existing sources show that the Tibetans still showed openness and accommodation towards the Capuchins. However, the Capuchins’ reports also underwent a shift in quality. Cassiano da Macerata in particular, and to a lesser extent Costantino da Loro, showed far greater interest in all these new developments, the areas travelled and the people and their customs, than had previously been the case in the mission’s past. An outstanding opportunity for this analysis is afforded by the Giornale by Cassiano da Macerata, in which he reported a large number of encounters (audiences, invitations, visits) between Tibetans and Capuchins. Their closeness, and the fact that an audience with the Chinese Amban took place in this context, enables comparisons to be drawn of the differences and similarities in the Tibetans’ management of the foreigners. The Tibetans’ behaviour is described as being “informal” to “friendly”, with cases of emphatically warm receptions predominating. In all these encounters between Tibetans and Capuchins, closeness and openness prevailed and the return of the Capuchins was repeatedly welcomed as a positive development. The Tibetans approached the Europeans as equals, while protocol-related constraints were relegated to a position of minor importance. The audience with the Chinese Amban was a stark contrast: emphatically ceremonial, far less informal and spontaneous: Long-drawn out waiting on several occasions, the receipt and offering of the kataks, the subservient behaviour of the interpreter. In my view, this is the source of a critical difference between the Tibetans and Chinese in their management of foreign visitors. The latter always attempted to create a relationship of dominance and subservience, even in cases of preferential treatment and exceptions in the audience protocol. For the Tibetans, too, the aspects of movement, placement and position and the physical activities of the participants played a key role in the reception ritual; however, the Tibetans were able to play down their own rank with grace and exploit “reciprocity to enhance expression” if they were able to assume their counterparts were familiar with and observed the appropriate rules. From their knowledge of the rules of behaviour in public situations, the Capuchins recognized that they were treated like high-ranking natives of the country. The Tibetans’ management of foreigners in the first half of the 18th century may indeed be defined as paradoxical; the Tibetans appeared to do all in their power to prevent “foreignness” from arising, or to diminish it if merely ignoring the discrepancies proved insufficient. At the beginning of the third stage, the missionaries achieved unbelievable political success. The Capuchin monks returned to Lhasa carrying letters for the Dalai Lama and Pho lha nas from Pope Clement XII (1730‑1740), dated 1738. In these letters the Pope demanded unrestricted permission for missionary work in Tibet. In September 1741, the letters were submitted in audiences to Pho lha nas and the Dalai Lama. As a reaction, four Tibetan documents that provide testimony of the different attitudes and responses on the part of the Tibetan secular and ecclesiastical hierarchy have come down to us. The two following documents in Tibetan language refer to religious liberty and freedom of conscience in Tibet. Soon after the audience on 9 September, 1741 with Pho lha nas, the Capuchins received a document issued by him, who granted them religious liberty and the right to undertake active missionary work. As far as it is possible to reconstruct from the texts, this document and the following of the Dalai Lama, were – according to Petech – apparently drafted in Tibetan by the Capuchins, as their style and phraseology point to an Italian origin. To understand how it was possible for the office of Pho lha nas to produce such a document in such a short time and that had so little of the Tibetans’ style in its concept and phraseology, we must assume with Petech that the Capuchins themselves had presented a corresponding draft. This was then adopted by Pho lha nas' chancery, the corresponding introductory and concluding formulae incorporated and the royal seal added. This document states that the Capuchins were not traders and do not mix with others, that they had come to Tibet for the benefit of all human beings; they wished to teach people to do good, to lead them to great happiness, and they preached the true law of God. The Capuchins were granted permission to do missionary work not only in Lhasa, but all over Tibet among lay people and clerics. Those who decided to turn to Christianity of their own free will would not be hindered. They and the missionaries would be under the special protection of the Regent. It is interesting to compare this document with that issued by the Dalai Lama some weeks later. Though it seems he had the same draft, the Dalai Lama’s document contains only a third of the material from Pho lha nas. The Dalai Lama starts with the same phrases, but the document thereafter differs greatly from the original draft. It does not make any reference to missionary work to be undertaken by the Capuchins; not one single reference to their religion can be found. It merely states that the Pope has sent the Capuchins to do good to all, and somewhat between the lines it appears that the Dalai Lama implicitly rejects religious liberty. The demands made by the missionaries are not mentioned. The differences between the two documents are striking. It seems that the Dalai Lama was much more careful in issuing his document, perhaps foreseeing the consequences more clearly than the Pho lha nas. He obviously merely adopted the Capuchins’ draft, and thus granted the Capuchins the right to convert Tibetans to Christianity either without having read the document precisely, or else without grasping its effects for the future. In contrast to Pho lha nas, the Dalai Lama deliberately did not meet the wishes of the Pope and the demands of the Capuchins, confining himself merely to polite phrases. For the first time it is obvious that the secular and ecclesiastical authorities differed in their assessment of the presence and activities of the strangers. It is even more important to note that Pho lha nas and the Dalai Lama had not settled their opinions amongst themselves, even though the privileges requested refer to questions of religion. These four documents show clearly the different opinions of secular and ecclesiastical parties. The two other Tibetan documents are the replies to the Pope’s letters. Unfortunately, only the contemporary Italian translations have come down to us. Unlike the papal breve, the two Tibetan letters do not present native Tibetan beliefs as superior to imported European or Catholic beliefs, and contain no demands to the Pope to change his behaviour or attitude etc. However, there is also no trace of any kind of acknowledgement of a theological or moral superiority of the Roman Pope. Again, there is a striking difference between the two documents and, again it is the Dalai Lama who does not refer to the demands of the Pope. Instead, he merely lists the presents received and the presents sent in return, and refers to the Capuchins as envoys. Pho lha nas also lists the presents received, but informs the Pope of the fact that he has granted religious freedom and complied with the Pope’s wishes. He also praises the Capuchins for their virtues and medical services. Finally he cannot help giving a little lecture about the tolerance shown by the Tibetans. However, neither letter contains any trace of indication that the senders are considering the possibility of converting to the Catholic faith. Only the Tibetans’ passive openness emphasises those moments of “foreignness” esteemed as positive, yet without considering their adoption and/or modification, and without any interest in deepening their knowledge of that foreignness. After the issue of this “edict of tolerance” by Pho lha nas, the Capuchins managed to achieve some success in their missionary work. In the end, twenty Tibetans converted to Catholicism. This success, however, did not last long and had an opposite effect, as inevitably conflicts arose in the political and legal domain. The Capuchins had generally painted too rosy a picture of the anticipated success of their work, so that it was not until a report was published on 18 July, 1742 after the “Christian persecutions” and signed by all the monks in the mission, that a more critical depiction of the mission’s situation at the beginning of Phase 3 became available, examining general conditions in more detail and showing the resistance and problems which beset the Capuchins’ efforts even before the subsequent conflict with the State authority. The missionaries listed reasons hindering a conversion to the Catholic faith and pointed out areas of resistance facing the dissemination of Catholic teachings. One such hindrance specified was the fear of retribution from secular or spiritual authorities in Tibet, which could be disarmed by the privilege of freedom of conscience. A further reason was the refusal, mainly by Tibetan monks, to renounce their faith, even while they praised the Christian faith. This was all the more prevalent if and since they enjoyed both spiritual and material gain from their religious function. In addition, the attitude of the people to the preachers of the Christian religion was not wholly positive: The Capuchins themselves also noted an uncomfortable atmosphere among the abbots and monks, but attributed it to the increase in the number of missionaries and the people’s awareness of the purpose of their presence. Fearing that the Gospel would spread throughout Tibet and recognizing that they had no weapons to combat the missionaries’ refutations, the Tibetan clergy had sabotaged the work of the monks. The eye-witness accounts of the Capuchins written after the conflict make clear how difficult they found it to grasp the turn of events. In particular, those written immediately after the conflict seem to imply that the conflict between Tibet’s secular and spiritual institutions and the first Tibetan Christians against the missionaries had erupted out of the blue, so to speak. The cautious attitude of the Buddhist clergy changed when the missionaries tried to impose their European legal traditions upon the Tibetans. Instead of ascribing their success to the tolerance shown by the Tibetans, the Capuchins ascribed their success to God – the God who sent the missionaries to Tibet to destroy Buddhism and spread Christianity. The twenty Tibetan converts were seen as a threat by the Tibetan government, which questioned their loyalty. Furthermore, the Capuchins demanded a special regulation of the Christian holidays for their converts. This was seen as interference in domestic affairs. The situation worsened when the converts refused to participate in the ‘u-lag ser­vice, to receive blessings from the Dalai Lama, and to recite the Mani prayer for Pho lha nas. This was seen as an infraction of loyalty, and under pressure from the Buddhist clergy the case was brought to court. When the Capuchins sought an audience with Pho lha nas they were refused – the first time the Regent had taken recourse to such a measure, as the Capuchins expressly remarked. In the presence of all the others waiting for permission for an audience, he sent an answer through his chamberlain: He was angry above all measure at the missionaries’ propagation of the claim that the Dalai Lama was not the reincarnation of Chenresig, Buddha was neither a saint nor a god, nor the founder of a religion, and that the Paldan Lhamo, the oracle of Lhasa, was a normal human being without any special magical powers. Rather, the Regent demanded of the missionaries that they worship Buddha, perform the skor ba and refrain from teaching the Tibetans about their religion. If they did not comply, they would have to face beheading. The trial also shows that the prosecution and defence did not work from a common approach. The defence of the Capuchins and the self-conducted defence of the Christian neophytes were transformed into an insult to the judges and the Regent respectively, because they denied the truth of the Tibetan religion and challenged the credibility of its representatives, the legitimacy of various institutions and the duty of subjection derived from the religious and secular features of the ruling system. The trial lasted for a period of ten days, with interruptions. The procedure seems to have been not without problems for the Tibetans, since the missionaries were finally asked to refrain from attending the negotiations. They interpreted this demand as an admission of injustice. However, another interpretation is possible, namely that the procedure was intended to exclude the missionaries from the process and thus retain a certain amount of scope for action from both the Tibetan and European standpoint. After all, the missionaries were not only spiritual teachers, but also representatives of a foreign power with which cordial relations had been maintained up to that point. The course of this trial allows for an interesting option of interpretation, namely that the conversion to Christianity would not in itself have been a crime had it not been for its concomitant violation of the duties of a Tibetan subject. It is important to note that it was not the missionaries who had been put on trial. The Tibetans’ own people were being accused, not the foreigners. The Tibetan converts had to be persecuted because they had preferred the foreign cult to their own tradition – implying a danger of the foreign replacing the indigenous. Although reproaches against the Capuchins were expressed in the course of the trial, the Tibetans were willing to compromise. They still seemed to believe it possible that both the missionaries and neophyte Christians could remain in Lhasa. The Capuchins, however, thought in terms of either/or: either stay in Lhasa with the right to practice the Catholic faith, even against the interests of the government and in disregard of cultural identity, or die as martyrs or leave Lhasa. The missionaries’ reports make clear that they considered the “King” the decisive address. However, they completely missed the tactical and strategic implications of his situation. Although obviously dependent on his benevolence, they insisted on sharpening the contrast instead of seeking the common interest. Pho lha nas had granted the privilege of “liberty of conscience” to the Capuchins and had entered into an obligation towards the Pope as a foreign ruler; but he also had to maintain his authority as Regent in relation to his subjects, and deal with the vehement protests of the clerical, and parts of the secular, hierarchy. His power and authority were at stake. In the end, after a long lawsuit two women and three men were sentenced and condemned to be publicly whipped. All accounts of the Capuchins agree that the Dalai Lama kept out of the whole affair, while Pho lha nas brought the case into court only under public pressure and intervention of the monasteries. In connection with the crisis, it is striking that the missionaries could not count on any important intercessor or lawyer in the Tibetan hierarchy that would donate his services out of altruism. On the other hand, the Capuchins had taken things too far. In a situation in which they were reliant on their opponents’ benevolence, they did almost everything to replace common ground with divisive factors. A new attempt to gain an audience with the Regent was launched in order to clarify the future prospects of the mission. On 5 June, the Capuchins went to the Regent’s First Chamberlain to ask him to convey a petition to the “King.” The Chamberlain attempted to avoid this duty and suggested that in his view, the missionaries would do well to restrict their preaching of religion to foreigners trading in Lhasa since the conversion of these foreigners to Christianity would not affect the Regent; they should not, however, attempt to convert Tibetans or condemn the Tibetan religion. The Capuchins explained that practising their own religion, like chanting prayers, was their duty, but their obligation was also to criticise the faults of other religions with the aim of eradicating them. This, they said, was the sole purpose of their journey. The Chamberlain then promised to present their petition to the Regent. Dissatisfied with this answer, the Capuchins directed a written request to the Pho lha nas on 8 June. In this, they explained that the only reason for their presence in Tibet was to propagate the religion of the sole and true founder of religion, Jesus Christ, who had called on them in the Gospels to take up this activity and also instructed that they should go forth from those places where no heed was paid to their words. They thus turned to Pho lha nas for advice as to what they should do. Kashmiri, Newari, Azara (i.e. Indians), Chinese, Turkish, Chasak, Kirghise and other peoples living in Tibet, adhere to their own religions and are supported as much as possible and not harmed. But you have spoken evil of the Tibetan religion. If any of us were to go to your country and preach our religion to you in the same manner as you have done with us, would you punish him? Destroying other religions implies nobody may follow his own religion. We have to defend our religion as you are defending yours. You came here of your own accord, we did not call you; as a consequence it is up to you to decide where to go and what to do. Before three of the Capuchin monks left Lhasa on 30 August, 1742, the Prefect Orazio again turned to the Regent’s First Chamberlain. Although still well-disposed towards the Capuchin monks, Pho lha nas made clear to them that he was acting under pressure from both secular and clerical protesters. He had been confronted with the threat that he would be remembered as the Regent who had introduced the religion of the unbelievers into Tibet. Finally, on 8 November, 1742, the missionaries were again permitted to take part in the Regents audience after a preliminary enquiry, and were received as cordially as in the past (exchange of kataks, seats of honour). Pho lha nas had realized that the Capuchins despised Tibetan Buddhists and their religious institutions. When asked why, the Capuchins replied somewhat laconically that they did not despise Tibetan Buddhism; they merely told nothing but the truth, namely that Tibetan Buddhism was bad, indeed. On 13 November, 1742, in an audience with the Dalai Lama, the newly completed book was presented. The monks were received with cordiality, and the talk was of everyday trivia. During this audience, in a private talk with an important court official the religion of the Capuchins was singled out for praise, in contrast to Islam. During a “conference” on religious issues, to which the Regent’s Chamberlain had invited the missionaries together with many secular and spiritual personalities, the Chamberlain not only expressed a positive opinion about the book disseminated by the Capuchins and about the Christian religion, but also rapped the knuckles of an opposing lama, saying that the accusations against the Christians were as unjustified as the verdict against the neophytes. During the discussion, a high-ranking lama even confirmed that Christianity had already been widespread in Tibet in the distant past, and that he remembered a corresponding text by an ancient author. The Memorie istoriche contains a reference to the handover of the letters of Cardinal Belluga to Pho lha nas and the Dalai Lama, accompanied by a small catechism and gifts. However, they received a cool reception; the letters were received with indifference and the gifts refused. We can conclude from the report of Tranquillo d’Apecchio dated 4 November, 1745 on the abandonment of the mission in Lhasa that the critical changes took place in the period between September 1744 and the monks’ departure from Lhasa on 20 April, 1745. The lamas again mobilized against the Capuchins, demanding that the missionaries be expelled. The missionaries and neophytes were attacked by the rabble in the city. In a letter, Orazio undertook a final attempt to rebut the accusations levelled against the Italian monks, to prove the essential nature of the Christian religion to the salvation of the soul, and to establish the worldwide benefit of Christianity as a guarantee of obedience among subjects. Pho lha nas replied immediately in a similarly lengthy epistle. However, now at the end of the dispute, even Pho lha nas’ enduring tolerance turned to intolerance in the face of the Capuchins’ incessant demands for tolerance, as he received no corresponding response from the missionaries. He wrote in a previously unheard-of sharp tone, commending the Tibetan religion above all other religions, because of its magic and its high moral standard. “All other religions were religions of infidels, inferior to ours.” Even if the Christian religion had some good features, it was inferior to the Tibetan religion because it condemned the Tibetan religion and its magical practices. He could see no difficulty in allowing the missionaries to preach Christian doctrine in Tibet, provided they recommended and praised the Tibetan religion at the same time, acknowledging that it surpassed the Christian religion on account of its inner goodness and perfection. If they were not ready to do this, then they should stop preaching the law of Christ in his kingdom. As for the decree of “liberty of conscience,” it had been granted out of ignorance. He was not ready to confirm it or to issue a new one. A new approach launched by the Capuchins with the aim of bringing a further missionary to Lhasa failed. The First Chamberlain announced the Regent’s reply in the anteroom of the audience chamber for all to hear: He would furnish a letter of consignment for the missionaries’ departure, but not for a new missionary, the Capuchins being “infidels”. The Capuchins insisted on being different and superior. Their radical perseverance brought the openness of the Tibetans to an end and made them hostile to the foreign element. The aggression of the Capuchins provoked the Tibetans into defending their own identity, which cannot be done without damaging the identity of the other. On each side, disappointment over the failure nourished doubts about the other side’s honesty. The Capuchins’ view of the Tibetans became more and more negative, far exceeding their negative attitude toward the Tibetan religion. To the same extent, the Capuchins lost the esteem of the Tibetans and were seen as infidels, no longer even getting credit for their medical help. There was yet another aspect in play here, which came increasingly to characterize the relations between Tibetans and Europeans in the nineteenth century and eventually contributed to the failure of the Capuchin mission. This was the Tibetans’ suspicion of having been deceived by the Capuchins, which was as yet not even openly expressed: “But why don’t you do what you did in the time of my predecessors?” asked Pho lha nas – meaning refraining from disturbing public order and religious peace. The answer was as distinct as it was wrong: We have always expressed openly what we have in mind and what we condemn. Isolation against foreign elements thus became an instrument in Tibetan politics. It is no surprise that this was encouraged by one particular social group in Tibetan society – namely the monks and their monasteries, whose social and intellectual identity was at stake. It is, however, noteworthy that the three large monasteries around Lhasa were only now mentioned for the first time as the promoters of the anti-foreigner (i.e. anti-Capuchin) policy. Under these conditions, survival became impossible for the Capuchin mission. The Tibetan government banned the Capuchins from converting Tibetans, although the conversion of foreigners such as the Nepalese was permitted. Despite the continued friendliness shown by the Tibetan government, the Capuchins left Lhasa on 20 April, Easter, 1745. Some days after their arrival in Nepal they received letters from their Nepalese friends in Lhasa. Only a few hours after their departure, many lamas had gathered and presented their complaints against the Capuchins to Pho lha nas. The protest became so tumultuous that he conceded by promising the hospice would be demolished. The stones were to be brought to the river bank for use in repairing the bank reinforcements in emergencies. However, this was also not enough for the furious mob. They demanded a troop of soldiers to bring back and punish the Italian monks. After some resistance, the Regent also conceded to this demand, since he was sure that the Capuchins had taken a different route from that planned by their pursuers. However, neither the demolition of the hospice nor the pursuit actually took place. No-one caught up with the missionaries, and no holy scriptures were buried under the hospice doorsteps. Apart from a short stay by the Lazarists Gabet and Huc, no other Christian mission was established in Lhasa before 1959. Nevertheless it is interesting to note that the books of the Capuchins were preserved for over a century. The famous bell inscribed with TE DEUM LAUDAMUS was preserved in the Jokhang. 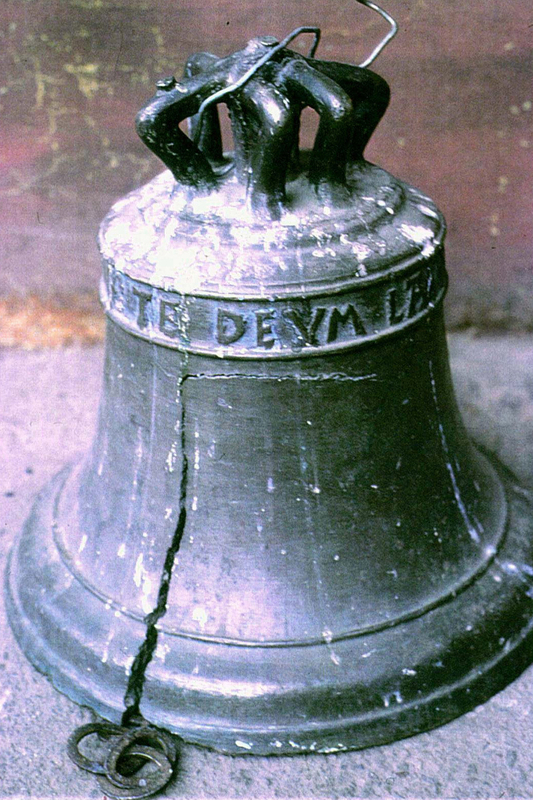 It is curious that the missionaries never mention this bell in their letters and reports; there is only one brief reference that in Bhatgaon, in Nepal, a bell had been created to their requirements. If the Capuchins had brought the bell with them from Italy, this would certainly have been reported, for they repeatedly mention, for example, the difficulties in transporting the Tibetan printing press. Since in the Jokhang “from the roof of the passage hang other bells of Tibetan and Chinese manufacture,” it can probably be assumed that the bell was manufactured by Newaris or Tibetans in Lhasa itself. Barnett, Robbie 1998, “Saving Tibet from Satan's Grip: Present-day Missionary Activity in Tibet,” In: Lungta 11, pp. 36-41. Bray, John (in press), “Early Protestant Missionary Engagement with the Himalayas and Tibet”. In: ibid. (ed. ), Ladakhi Histories: Local and Regional Perspectives. Leiden. Callaey, Frédégard OFM Cap. 1934, “Missionaires Capucins et la civilisation Thibétaine.” In: Ètudes Franciscaines 8, pp. 129-139. Camps, A. OFM. 1964, “Luciano Petech und die katholische Tibetmission im 17. und 18. Jahrhundert.” In: Neue Zeitschrift für Missionswissenschaft 20, pp. 62-64. Candler, Edmund 1905, The Unveiling of Lhasa, London. Cassiano da Macerata 1767, Memorie istoriche delle virtu', viaggi, e fatiche del P. Giuseppe Maria de' Bernini da Gargano, Capuccino della provincia di Brescia, e vice-profetto delle missioni del Thibet.Verona. Chevalier, Jean-Baptiste 1984, Les aventures de Jean-Baptiste Chevalier dans l'Inde orientale (1752-1765). Paris. DL 7: Lcang skya Rol pa'i rdo rje. rGyal ba'i dbang po thams cad mkyen gzigs rdo rje 'chang blo bzang bskal bzang rgyathso dpal bzang po'i zhal snga nas kyi rnam par tharpa mdo tsam brjod pa dpag bsam rin poche'i snye ma (rnam thar). mDo mkhar Tshe ring dbang rgyal 1733, dPal mi'i dbang po'i rtogs brjod pa 'jig rten kun tu dga' ba'i gtam. Engelhardt, Isrun 1999, “Zur Ent-Fremdung des Europäers: Gastfreundschaft und Abbau von Fremdheit in den Beziehungen von Tibetern zu Europäern im 18. Jahrhundert.” In: Dietmar Rothermund (ed. ), Aneignung und Selbst­behauptung: Antworten auf die europäische Expansion. München, pp. 183-202. Engelhardt, Isrun 2002, “The Closing of the Gates: Tibetan-European Relations at the End of the Eighteenth Century.” In: Henk Blezer (ed. ), Tibet, Past and Present: Tibetan Studies I, (PIATS 2000), Leiden, pp. 229-245. Fabri, J. E. 1783, Sammlung von Stadt-, Land- und Reisebeschreibungen. Halle. Felix d'Anvers (ab Antwerpen) OFM Cap. 1912 a, “On the Persian Farmans Granted to the Jesuits by the Moghul Emperors, and the Tibetan and Newari Farmans Granted to the Capuchin Missionaries in Tibet and Nepal.” In: JASB, NS 8, pp. 325-332. Felix d'Anvers (ab Antwerpen) OFM Cap. 1912 b, “Remarks on the Tibetan Manuscript Vocabularies in Bishop's College, Calcutta.” In: JASB, NS, 8, pp. 379-397. Filibeck, Elena Rossi de 1998, “Cassiano Beligatti e il Tibet” In: Atti del Convegno Internazionale di Studi in onore di Giuseppe Tucci, Macerata, pp. 501-514. Filibeck, Elena Rossi de 1998, “Il contributo di Cassiano Beligatti alla conoscenza del Tibet.” In: Le Marche et l'Oriente: Una Tradizione ininterotta da Matteo Ricci a Giuseppe Tucci. Atti del Convegno Internazionale Macerata, 23-26 Ottobre 1996 a cura di Francesco d'Arelli. Roma, pp. 261-272. Filippi, Filippo de 1932, An Account of Tibet: The Travels of Ippolito Desideri of Pistoia, S.J., 1712-1727. London. Francesco Orazio della Penna di Billi 1740, Missio Apostolica, Thibetano-Seraphica: das ist: Neue durch päpstliche Gewalt in dem großen Thibetanischen Reich von den P.P. Capucineren aufgerichtete Mission … München. “Fratri Cappuccini delle Marche” 2003, In: Voce Francescana 23, No. 2, pp. 48-102. Giorgi, Antonio 2001, Alphabetum Tibetanum Teil I, übersetzt von Peter Lindegger. Rikon. Giorgi, Antonio 1999, Alphabetum Tibetanum Teil II, Schreibgerät, Beschreibmaterial, Druck- und Buchwesen, eine Darstellung der Schrift und der Orthographie der Tibeter in Texten samt den frühen Übersetzungsversuchen aus dem 18. Jahrhundert, übersetzt von Peter Lindegger. Rikon. Giorgi, Antonio A. 1987, Alphabetum Tibetanum missionum apostolicarum commodo editum. Unveränderter Nachdruck der Ausgabe Rom 1762/63. Mit einer Einleitung von Rudolf Kaschewsky. Köln. Giorgi, Antonio A. 1768, Das Alphabetum Tibetanum in Auszügen. Aus dem Lateinischen übersetzt und bearbeitet von Jeremias Nicolaus Eyring. Halle (repr. Ulm 1989). Henkel, Willi 1973, “Versuche einer Missionsgründung in Tibet: Die aposto­lische Präfektur Tibet 1703-1821.” In: Josef Metzler (ed. ), Sacrae Congreationis de Propaganda Fide memoria rerum, vol. 2, Roma, pp. 962-975. Hodgson, Brian H. 1847, “Regarding a Donation of Certain Works he Desires to Forward to his Holiness the Pope.” IN: JASB 16, pp. 150-152. Hodgson, Brian H. 1848, “Relics of the Catholic Mission in Tibet.” In: JASB 17pp. 224-225. Jann, Adelhelm OFM Cap. 1930, “Zur Kulturarbeit der katholischen Kirche in Innerasien. Die missionarische und literarische Tätigkeit des apostolischen Präfekten von Tibet, P. Franciscus Horatius Oliverius della Penna di Billi (1712-1745).” In: Studien aus dem Gebiete von Kirche und Kultur. Festschrift Gustav Schnürer. Paderborn, pp. 127-207. Kaschewsky, Rudolf 1986, “Die 'Drei Kosbarkeiten' in Georgius' Alphabetum Tibetanum.” In: Helmut Eimer (ed. ), Vicitrakusumanjali. Volume Presented to Richard Othon Meisezahl on the Occasion of his Eightieth Birthday. Bonn, pp. 125-130. Kaschewsky, Rudolf 1988, “Lamaistische Gottheiten in Georgis Alphabetum Tibetanum.” In: Johannes Triebel (ed.) 1988, Der Missionar als Forscher: Beiträge christlicher Missionare zur Erforschung fremder Kulturen und Religionen. Gütersloh, pp. 123-129. Kaschewsky, Rudolf 1997,“ Das Tibetbild im Westen vor dem 20. Jahrhundert”, In: Thierry Dodin & Heinz Räther (eds. ), Mythos Tibet: Wahrnehmungen, Projektionen, Phantasien. Köln, pp. 16-30. Kaschewsky, Rudolf 2001, “The Image of Tibet in the West before the Nineteenth Century.” In: Thierry Dodin & Heinz Räther (eds. ), Imagining Tibet: Perceptions, Projections and Fantasies. Boston, pp. 3-20. Khach'ikian, Levon & P'ap'azyan, Hakob D. 1984, Hovannes Ter Davt'yan Jughayets'u Hashvetumare. Erevan. Khachikian, Levon 1966, “The Ledger of the Merchant Hovannes Joughayetsi.” In: JASB, 4th ser., 8, pp. 153-186. Lenhart, John M. 1950, “Capuchins Introduce Printing into Tibet in 1741.” In: Franciscan Studies, 10, pp. 69-72. Lindegger, Peter (ed.) 2001, Dokumente zur sogenannten Christenverfolgung vom Mai 1742 in Lhasa. Rikon. Lobue, Erberto 2002, “Newar Sculptors and Tibetan Patrons in the 20th Century.” In: The Tibet Journal 27 (3&4), pp. 121-171. Lopez, Donald S., Jr. 1998, Prisoners of Shangri-La: Tibetan Buddhism and the West. Chicago. Miller, Beatrice M. 1988, “Lhasa: An International Politico-Economic Center through the Centuries: A Very Preliminary Examination.” In: Helga Uebach & Jampa L. Panglung (eds. ), Tibetan Studies: Proceedings of the 4th Seminar of the International Association for Tibetan Studies Schloss Hohenkammer - Munich 1985. München, pp. 253-262. Osterhammel, Jürgen 1997, “Gastfreiheit und Fremdenabwehr: Interkulturelle Ambivalenzen in der Frühen Neuzeit.” In: Herfried Münkler, (ed. ), Furcht und Faszination: Facetten der Fremdheit. Berlin, pp. 379-436. Petech, Luciano 1952-1956, I Missionari Italiani nel Tibet e nel Nepal (Il Nuovo Ramusio II), 7 vols. Roma. Petech, Luciano 1961, “Die katholischen Tibet-Missionen im 17. und 18. Jahrhundert.” In: Saeculum 12, pp. 358-365. Petech, Luciano 1972, China and Tibet in the Early XVIIIth Century. History of the Establishment of the Chinese Protectorate. 2nd ed. Leiden. 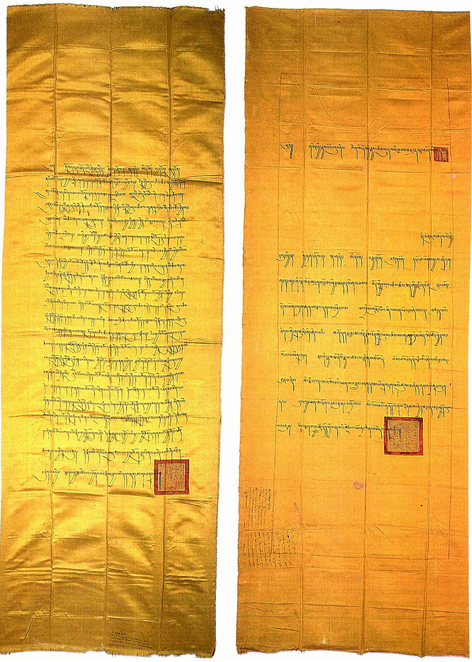 [Petech, Luciano] 1988a, “Two Privileges of Religious Freedom Granted by the Dalai Lama on Yellow Silk,” In: Sotheby’s London: The Library of Philip Robinson, Part II The Chinese Collection, November 22, 1988, Nr. 140, pp. 126-128. Petech, Luciano 1988b, “China and the European Travellers in Tibet 1860-1880.” In: ibid, Selected Papers on Asian History. Roma (orig. 1976), pp. 323-354. Petech, Luciano 1998, “I cappuccini marchigiani e il Tibet.” In: Le Marche et l'Oriente. Una Tradizione ininterotta da Matteo Ricci a Giuseppe Tucci. Atti del Convegno Internazionale Macerata, 23-26 Ottobre 1996 a cura di Francesco d'Arelli. Roma, pp. 247-260. Richardson, Hugh E. 1998, “Armenians in India and Tibet.” In: ibid. High Peaks, Pure Earth. Collected Writings on Tibetan History and Culture, ed. by Michael Aris. London (orig. 1981), pp. 462-467. Richardson, Hugh E. 1998. “The Jo-khang ‘Cathedral’ of Lhasa.” In: ibid. High Peaks, Pure Earth, pp. 237-260. Ronge, Veronika & Namgyal 1980: “Casting of Tibetan Bells.” In: Aris, Michael & Suu, Kyi, Aung San (eds.) Tibetan Studies in Honour of Hugh Richardson, Delhi 1980, pp. 269-276. Schäfer, Ernst 1949, Fest der weißen Schleier. Braunschweig. Schubert, Johannes 1950, “Typographia Tibetana.” In: Gutenberg Jahrbuch, pp. 280-298. Streit, Robert - Dindinger, Johannes 1931, Biblioteca Missionum VI. Münster. Terzorio, Clemente da 1932, Le missioni di minori Cappuccini. vol. VIII. Indie orientali. Roma. Tucci, Giuseppe 1943, “Le Missione Cattoliche e il Tibet.” In: Le Missione Cattoliche e la Cultura dell' Oriente. Roma: ISMEO, pp. 215-231. Vannini, Fulgentius OFM Cap. 1976, The Bell of Lhasa. New Delhi. Wendt, Reinhard 2000. “Mission in vielen Zungen: Der Beitrag der Jesuiten zur Erfassung und Klassifizierung der Sprachen der Welt.” In: Meier, Johannes (ed.) 2000. “… usque ultimum terrae”: Die Jesuiten und die transkontinentale Ausbreitung des Christentums 1540-1773. Göttingen. Petech 1988, pp. 350-351, translation from the Chinese translation, as in Prževal’kskij, Nikolaj M. Iz Zajsana čerez Chami v Tibet i na verhovja Želtoj Reki, Moskva 1948 (orig. 1883): pp. 225-226; only the Russian translation via the Mongolian from the Tibetan original has come down to us. Petech, I Missionari Italiani nel Tibet e nel Nepal: I Cappuccini Marchigiani, Parte I-IV. Roma 1952-1956, quoted henceforth as Petech I-IV. I am very grateful to Harald Grünwald, Urbino, for his invaluable help in translating the Italian texts. Domenico da Fano, in Petech III, CR 1, p. 29 and Felice da Montecchio, ibid. CR 2, p. 42; See also Miller 1988, pp. 253-262. “Tertia missio foret in interiore Bengala ad caput Gangis vergendo et sensim ad Thibet utrum­que penetrandum, de quo audivi quod ibi sunt populi qui aliquando Christiani fuerunt, sed defectu sacerdotum iam nesciunt ipsi quid sint; nec enim sunt gentiles; sunt inimicissime mahometanos et quando forte quis Christianos ex mercatoribus Armeniis illac pertransiit, magna illum benevolentia exeperunt. De illis et apud libros legi, de illis audivi mahomettanos quasi eadem dicentes et gentiles et Armenos.” (Arch. Prop. Fide, Scr. Congressi, vol. 8, (1701-1704), fol. 534 a). On the history of the mission of the Capuchins in Lhasa, see Petech I, pp. XXXIV-LXV; 1961; 1998; Vannini 1976, Jann 1930; Terzorio 1932; Henkel 1973. Apart from Petech, all descriptions are written from the missionary viewpoint. See Cassiano da Macerata, Giornale in Petech IV, pp. 3-63; Domenico da Fano, in Petech III, CR I, pp. 3-37. On Armenians in Lhasa see Khachikian 1966, pp. 153-186; Khach’ikian & P’ap’azyan 1984; Richardson 1998, pp. 462-467. Domenico da Fano, in Petech III, CR 1, p. 29. Domenico da Fano, in Petech I, CL 20, p. 58. See Guiseppe da Ascoli, in Petech I, CL 11, p. 38; Francesco Maria da Tours, in ibid. CL 12, p. 41; Giovanni da Fano, in ibid. CL 19, p. 50; Domenico da Fano, in Petech III, CR I, p. 21. Francesco Maria da Tours, in Petech I, CL 9, p. 35; Giuseppe da Ascoli, in Petech I, CL 11, p. 37; Francesco Maria da Tours, in Petech I, CL 12, p. 39; Lorenzo d’Angou­leme, in Petech I, CL 14, p. 43; Domenico da Fano, in Petech III, CR 1, p. 34. Giovanni da Fano, in Petech I, CL 19, p. 51; Domenico da Fano, in Petech I, CL 20, p. 56 and in Petech III, CR 1, p. 35. Giovanni da Fano, in Petech I, CL 19, p. 51; Domenico da Fano, in Petech I, CL 20, p. 56 and in Petech III, CR 1, p. 34-35. Francesco Maria da Tours, in Petech I, CL 12, p. 41; Giovanni da Fano, in Petech I, CL 19, p. 50; Domenico da Fano, in Petech I, CL 20, p. 56. Domenico da Fano, in Petech III, CR 1, p. 34. Guiseppe d’Ascoli, in Petech I, CL 11, p. 37. Domenico da Fano, in Petech III, CR I, p. 34. Domenico da Fano, in Petech I, CL 20, p. 57. Domenico da Fano, in Petech III, CR 1, pp. 29-30. Domenico da Fano, in Petech III, CR 1, p. 16. For the history of the whole period, see Petech 1972. Domenico da Fano, in Petech I, CL 33, pp. 83-86 and CL 34, pp. 86-88. Domenico da Fano 3 March, 1717, in Petech I, CL 35, p. 90 and CL 36, p. 91. Desideri, in Petech V, DR 1, p. 217. When the Capuchins arrived in 1716 in Lhasa they found Desideri already there, having arrived around six months previously. However, a closer examination of him and the following conflict with the Capuchins is beyond the scope of this study. There is a large volume of literature concerning Desideri, the most important work of which remains Petech, I Missionari Italiani nel Tibet e nel Nepal: Ippolito Desideri S.I., V-VII. Desideri, in Petech V, DL 10, p. 51. The letter refers to the benevolence and support given by Lha bzang Khan to the Christians in his country, including the missionaries, requests that this support may continue and asks Lha bzang Khan to become their patron (cf. Petech IV, CD 2, p. 176-177). The text primarily contains expressions serving to further mutual relations. In a letter of 28 May, 1718, given in Petech I, CL 39, p. 107, Domenico even relates that the fact that he had returned with a letter to the Regent from the Pope had generated great respect for the Capuchins from the people and the Court, and that the Regent had unmistakably given to understand how much he valued this message, the European monks and their religion. Cf. letter dated 15 February, 1717 in Petech I, CL 33, p. 84. Cf. however, the harsh criticism of Desideri, who criticized both the language and content of this translation, completed by one of their interpreters, a Hindu (“idolatro”) with no idea of Christianity, cf. Desideri, in Petech V, DD. 1, p. 50; DD 2, p. 102,110, 112, yet which Gioacchino da S. Anatolia, “uomo collerico e piuttosto limitato” (Petech 1998, pp. 251-252) vehemently rebutted (letters dated 2 August, in Petech I, CL 52, and 23 August 1731, ibid., CL 53). Cf. letters of the 26 June, 1717 and 28 May,1718 in Petech I, CL 37, p. 94 and CL 39, p. 108. Desideri “Riassunto della terza difesa per la causa contro i capuccini 1729”, in Petech V, DD. 3, pp. 110-113; DL 10, p. 50 and Petech, p. 232, DL 10, n. 3. However, Desideri is attacked even today from the Francescan and Capuchin’s side, cf. Fratri Cpaccini 2003. Cf. Petech I, pp. XCI-XCII. “Breve relaziane del P. Domenico da Fano (1713),” in Petech III, CR 1, p. 20. Domenico da Fano in a letter from 28 May, 1718, in: Petech I, CL, 34, p. 87. They were rejected as “unbelievers,” “… furono da tutti rigettati come infideli …” Domenico da Fano, in: Petech I, CL 39, p. 107. Cf. letters of the 15 April, 1717 and 28 May, 1718 in Petech I, CL 34, p. 84, 87 and I, CL 39, p. 107. Ippolito Desideri. Relazione, in Petech V, pp. 195-196, 197-198 or in Filippo di Filippi 1937, pp. 100, 102, 104; Domenico da Fano, in Petech I, CL 34, p. 87 and CL 39, p. 107. The Regent in particular had placed emphasis on studying the Tibetan language: Petech III, CR 7, pp. 193-194. Perhaps he did so with the help of Desideri’s older translation, cf. Petech 1961, p. 363. On the translations and Tibetan works of Orazio, which all seem to have been lost, see Petech I, pp. LXXXVI-XCIV; Vannini 1976, pp. 421-436. On the changeful history of these dictionaries, cf. Felix d'Anvers (ab Antwerpen) OFM Cap. 1912b; Jann 1930, pp. 156-159; Streit-Dindinger 1931, pp. 96-100; Petech I, pp. XCII-XCIV; Vannini 1976, pp. 437-442.; Claudio Cardelli: “Ritrovato il dizionario italo-tibetano di Padre Orazio,” (ca. 1999); www.montefeltro.net/pennabilli/tibet.htm; John Bray (in press); Elio Marini, “Orazio's Dictionary,” www.oraziodellapenna.com/ eng_vocabolario.htm. (ca. 2004). From which it appears that the dictionaries, which had been in the Bishop’s College in Calcutta so long (cf. Felix d'Anvers 1912b; Petech 1961, p. 364), seem now to be in Italy. Cf. Kaschewsky 1996, pp. 21-22 und 2001, p. 10; Lopez 1998, pp. 114-134: 132-133; Petech IV, CO, pp. 168-172, 272; VI, p. 351, n. 183. Cf. Schubert 1950, pp. 284-286 and Lenhart 1950. However, see Petech’s criticism on Lenhart, in Petech I, p. 191, n. 131. “Privilegio doganale rilasciato da Lha bzang khan” from 9 November, 1716, in: Petech IV, CD 6, p. 183. Domenico da Fano, in Petech I, CL 36, p. 92. Domenico da Fano 26 June, 1717, in Petech I, CL 37, p. 95; see also the recommendations from the first stage: Giovanni da Fano, in Petech I, CL 19, p. 51. The gift from the Capuchins accompanying the Pope’s missive had consisted of two weapons (sic!). Letter from Domenico da Fano dated 26 June, 1717 from Lhasa to the Procurator General, in Petech I, CL 37 p. 93: “I brought two rifles for this king (i.e. the Regent of the time in Lhasa); but the Rajah of Katmandu did not want them to leave his country.” The Regent took up the matter personally, writing an appropriate message to the Rajah of Katmandu and receiving the rifles back. Cf. Petech I, p. LIV. Petech attributed this to the insignificance of the Capuchins; however, this is in keeping with the general pattern of Tibetan sources, in which foreigners are mentioned only briefly and in exceptional cases. Cf. the letters from 28 May, 1718, 25 January, 1719 and from 2 February, 1719 in Petech I, CL 39, CL 41 and CL 42. They were never rebuilt, cf. Petech I, p. LIII. Cf. Petech I, CL 39, pp. 107-110. Giuseppe Felice da Morro in a letter of 21 June,1721 in Petech I, CL 44, p. 119. Cf. the letter of Domenico of 2 February, 1719 in Petech I, CL 42, p. 115. “… Lami, Rangiambà e Trabà lodano la nostra S. Legge,” Gioacchino da S. Anatolia, in Petech I, CL 46, p. 125. Cf. Petech I, CL 46, p. 124f. Gioacchino da S. Anatolia, 20 November, 1724, in Petech I, CL 46, pp. 124-125. Orazio dalla Penna, in Petech I, CL 47, p. 131. “… che l’haverissimo riverito come Principe e non adorato come Dio,” Gioacchino da S. Anatolia, in Petech I, CL 46, p. 126. Gioacchino da S. Anatolia, in Petech I, CL 46, p. 127. “Documento di esenzione Doganale” 4 December, 1727(?) in Petech IV, CD 16, p. 194. “Strumento di compra-vendita del terreno per l’ospizio e la chiesa” from 8 April, 1725 in Petech IV, CD 10, pp. 188-189. Gioacchino da S. Anatolia is very enthusiastic, because he had never heard before that foreigners had succeeded in owning property in Tibet, see Petech III, CR 9, p. 215. The place for the building, which is called shar rgyud na kha, has not yet been identified. It is only known that it was near Mo ru monastery in the North-East of Lhasa. See Cassiano da Macerata, Giornale, in Petech. IV, p. 116. The size addendum is missing in the contemporary Italian translation and varies in the contemporary German translations from between forty-seven and sixty-five meters on each side. See Francesco Orazio della Penna 1740, p. 142; Fabri 1783, pp. 312-313. “Concessione di esenzione da tasse sul convento” from 4 November, 1727(?) in Petech IV, CD 15, p. 193. Orazio della Penna, in his reports from 1938, in: Petech III, CR 4, p. 91 and CR 5, p. 158. The official Tibetan biography of the 7th Dalai Lama reported the flood, yet omitted all mention of the public outcry against the Capuchins (Cf. Petech III, p. 348, n. 4). Petech concludes that the Tibetan authorities attached little significance to the outcry. Cf. the Life of the 7th Dalai Lama, f. 109 a.
 Gioacchino da San Anatolia in his late report from 1746, Petech III, CR 9, p. 216. Vannini 1976, pp. 225-234, who described occurrences with a conspicuous ideological intention and presented a highly detailed reconstruction of events, strangely failed to list this episode of all episodes. However, it is remarkable that the Capuchins did not themselves think of providing the building materials for this purpose. The almost contemporaneous account by Cassiano da Macerata in his travel writings Giornale points out the important role played by building materials for the construction of the dam during the Monlam festival: “Tali pietre, che gli devoti a loro spese e colle loro mani hanno adunato vicino al fiume, terminato il Mönlam il Re le fà impiegare in reparationi dell´argine se ha sofferto in qualche parte, o le fa ammucchiare ordinatamente presso delle stesso argino per haverle pronte in caso di bisognio; non saprei che lodarne il costume, se fusse senza relatione alla religione loro.” (Giornale, in Petech IV, p. 132). Even during the Mönlam of 1939, carrying stones along the bank of the Kyichu as protection against the annual summer floods was a highly meritorious activity, cf. Schäfer 1949, p. 175. Petech III, CR 5, pp. 158-159. Gioacchino da S. Anatolia, in: Petech I, CL 53, p. 155. Orazio della Penna 1726, Petech I, CL 48, p. 132, according to a judgment of the court, after Tibetan religious authorities had examined the Christian religion. According to Orazio (Petech I, CL 48, p. 132), the Dalai Lama refused to grant the people one of the customary blessings since the people had attempted to destroy the Capuchins’ building although the Capuchins had received written permission for the construction from the government. This, or possibly only simulated eagerness, was the reason for the people bringing charges against the Capuchins before the court. As this and other letters show, this verdict was not directed at protecting the freedom of the mission. Orazio della Penna, in Petech I, CL 48, pp. 132-133. Orazio della Penna, in Petech III, CR 4, p. 88. Orazio della Penna, in Petech III, CR 6, p. 175 and CR 7, p. 193; Gioacchino da S. Anatolia, in Petech I, CL 53, p. 159 and CL 56, p. 172; ibid. in Petech III, CR 9, pp. 217-218. Orazio della Penna, in: Petech III, CR 4, p. 104 and CR 5, p. 154; Petech I, CL 47, p. 130. Cf. Petech III, CR 4, p. 104. For example Sems dpa' chen po, rTse drung Rinpoche, Karmapa Nomun Qagan, Petech III, CR 4, p. 94. On the persons cf. Petech III, CR 4, n. 6, p. 348 and Petech I, CL 56, p. 172. See also Petech III, CR 5, pp. 154-155 und CR 3, pp. 103-104. Cf. Petech III, CR 4, p. 104; the clearest sign of such a change is given as the fact that the “King” (Pho lha nas) ate meat and did not consider it a sin (cf. Petech III, CR 4, p. 88). For example, Petech I, CL 55, p. 167 and Petech I, CL 56, p. 173. “Riposta del VII Dalai-Lama [?] ad una scrittura apologetica di Cappuccini,” in Petech IV, CO I, pp. 145-147 and “Riposta di Missionari alla scritto precedente,” Petech IV, CO 2, pp. 148-157. Petech IV, CO I, p. 147. Petech IV, CO 2, p. 156. See Petech I, pp. 222-223; Petech 1972, p. 153. Gioacchino da S. Anatolia, in Petech I, CL 56, pp. 173-174. Orazio della Penna, in Petech I, CR 5, p. 161. Orazio della Penna, in Petech III, CR 4, p. 93. “Attestato di riconoscimento di meriti di missionari” from 1 July, 1732, in Petech IV, CD 18, pp.196-198 and “Documento di riconoscimento di meriti e di commiato” from 7 July, 1733; ibid. CD 21, pp. 202-204. Both documents underline the fact the both monks had made extensive efforts to come to Tibet and Lhasa (nor 'dzin, the hub of the universe), that their actions were aimed at the good of all sentient beings, that they had behaved in a morally impeccable and altruistic manner. The medical services supplied free of charge by Father Gioacchino da S. Anatolia were emphasized. See the contemporary translation in: Terzorio 1932, pp. 345-346, where exactly the opposite is alleged: that the Capuchins provided protection to the Tibetans! Cf. Also Petech IV, p. 279, CD 21, n.1. Even as modern a Capuchin as Fulgentius Vannini 1976, p. 273, translates “… .but realizing that we [the Tibetans] could not be of any material help to you …” Similarly Jann 1930, p. 171. Cf. Costantino in Petech II, CL 71, p. 72. Orazio della Penna in his letter of 14 October, 1741 (Petech II, CL 70). Exhaustive details of the journey from Kathmandu to Lhasa are given in the Giornale, in Petech IV, pp. 58 -111. On the condition of the hospice and the purposes for which it had been used since the Capuchins’ departure in 1733, cf. Giornale in Petech IV, p. 109 f.
 According to the Giornale (Petech IV, p. 111), the “King” also supplied 25 assistants to perform cleaning and renovation of the building. Costantino da Loro (Petech II, CL 71, p. 73) reported that the “King” ordered the authorities to provide appropriate com­pen­sation for the Capuchins. Both the letters of Constantino da Loro (Petech II, CL 62, 64 and primarily in CL 71), and especially the Giornale (Petech IV, pp. 1-142) are detailed, chronologically organized travel descriptions that far exceed the narrow scope of mission reports. The detail-packed reports on religious festivals also demonstrate that the interest in foreign life reduced – and, at least initially, overcame – the Capuchins’ revulsion at its heathen guise. Giornale in Petech IV, pp. 103-105, 112-117, 120-122, 128. In CL 71 and CR 9 too, indications of the audiences and visits mentioned by­ Cassiano can be found. Cf. Engelhardt 1999, p. 10. “Breve di Clemente XII a Pho lha nas” from 24 September 24, 1738. Petech IV, CD 2, pp. 176-177 and “Breve di Clemente XII a rGyal-sras Rin-po-che, vicario del Dalai-Lama” from 24 September, 1738 in ibid. CD 3, pp. 178-179. English translations of both letters written in Latin, in Vannini 1976, pp. 317-318 and 322-323. “Privilegio di libertà religiosa rilasciato da Pho-lha-nas” from September 9, 1741. in Pe­tech IV, CD 25, pp. 208-211 and “Privilegio di libertà religiosa rilasciato dal VII Dalai-Lama” from October 7, 1741 in ibid., CD 26, p. 214. English translation of both documents: Vannini 1976, pp. 320-321 and 323-324. English translation of the document of Pho lha nas, Richardson, Bodlein Library, Oxford, MS. Or. Richardson 19, fol. 77; German translation of both, Lindegger 2001, pp. 7-12. Petech 1988, outlines the history of the originals on yellow silk, which are in perfect condition. Formerly they were in the museum of Stefano Borgia at Velletri near Rome and were sold in 1804 to Joachim Murat, king of Naples. Somehow they came into the collection of the British collector Sir Thomas Philips and passed in 1946 to the collection of Philip Robinson. Long thought to be lost (see even Lindegger 2001, pp. 7, 11), they came in 1988 through an auction of Sothebys to the Bavarian State Library in Munich as documents cod. tibet 507 and 508. Knowing that the documents had stayed in the Phillips Collection since 1845, it is difficult to accept the Belgian Capuchin Felix d’Anvers’ claim to having seen them in Rome in 1912. See Felix d’Anvers 1912 a, p. 331. Cf. Petech III, CR 9, p. 230 und Petech II, CL 70, p. 44. See Petech IV, CD 25, p. 281, notes 1 and 3. In the following passage Petech IV, p. 281, n. 4, identifies characteristic phraseology as used by Italian notaries, which had then been “somewhat uncomfortably” translated into Tibetan: “Colui nella cui mente sorge il raggio luminoso di luce di Dio per abbracciare questa legge, se spontaneamente e di proprio arbitrio desidera abbracciare la Vera Legge, l´abbraccia ed l´ha abbracciata, nessuno di voi funzionari superiori opponga ostacoli a che egli osservi bene, spontaneamente e pubblicamente quella Vera Legge.” CD 25, p. 211. “Riposta del Dalai-Lama al breve di Clemente XII” from 7 October, 1741, in Petech IV, CD 27, pp. 214-215 and “Riposta di Pho lha nas al breve di Clemente XII” from 11 October, 1741, in ibid., CD 28, pp. 215-216. Cf. Petech II, CL 72, pp. 83-108; German translation: Lindegger 2001, pp. 13-37. The Prefect, Orazio della Penna, Floriano da Jesi, Tranquillo d'Apecchio, Costantino da Loro, Cassiano da Macerata und Giuseppe Maria da Gargnano. Petech II, CL 72, p. 84. Petech II, CL 72, p. 85. “Molti non volevano ascoltarli; moltissimi se ne ridevano; molti disprezzavano le di loro parole,” Petech II, CL 72, p. 85. Cf. the letter of Orazio della Penna from 26 August, 1742 in Petech II, CL 74. In Cassiano da Macerata Memorie Istoriche 1767, p. 27, there is a reference to the enmity of the Tibetan clergy, who are described as viewing the favors bestowed on the Capuchins by the “King” with distrust and having undertaken everything within their power to convince prospective converts to reconsider. In letters, reports etc. we find both an attempt at rational reconstruction and a retreat into models of explanation that contain non-rational components, such as Costantino da Loro, in Petech II, CL 73, p. 115; in the report in Petech II, CL 72, p. 86; Gioacchino, in Petech III, CR 9, p. 234; Giuseppe Maria, in Petech II, CL 75, p. 133. The two versions of the reports that were signed by all monks present in Lhasa and dated 18 July, 1742 are summarized in Petech II, CL 72, and the three letters by Costantino da Loro dated 21 July, 1742 summarized in Petech II, CL 73. Petech II, CL 72, p. 86. “Tibetans were required to participate in Buddhist prayers as a form of labour-tax due to the state,” Petech 1988, 127. However, cf. Giornale (Petech IV, p. 72), how the Capuchins had benefited from ‘u lag services on their way to Lhasa. Petech II, CL 72, pp. 86-87 and Costatino da Loro, in ibid. CL 73, p. 116; Gioacchino da S. Anatolia, in Petech III, CR 9, pp. 234-235. Gioacchino da S. Anatolia, in Petech III, CR 9, p. 235; Petech II, CL 72, p. 88 and Costatino da Loro, in ibid. CL 73, p. 117. Petech II, CL 72, p. 90. Petech II, CL 72, p. 98. Petech II, CL 72, pp. 94-95. One of the judges tried to explain to the missionaries that the court case did not concern the question of whether the Christian god is the true one or not. See Petech II, CL 72, p. 122. Petech II, CL 72, p. 99. Only Gioacchino da S. Anatolia mentions the refusal to worship the Dalai Lama in the trial. See Petech III, CR 9, p. 237. Petech II, CL 72, pp. 99-102. Cassiano da Macerata, Memorie Istoriche 1767, p. 261. Giuseppe Maria, although not an eye witness, referred in particular to the role played by the Tibetan monks in making the “King” reconsider. 400 monks from a monastery, he wrote, appeared before the Pho lha nas in a state of great excitement, accusing him of destroying their religion and finally threatening him with a shameful death – a threat that he, mindful of the violent end met by three of his predecessors, took as occasion to agree to the lamas’ demands. In his letter of 26 August, 1742, Orazio expressly refers to the role of the “King,” in Petech II, CL 74, p. 129. Petech II, CL 72, p. 102. The request contained an enquiry to the Regent as to how, given the conditions, the missionaries could fulfill the task for which the Pope had sent them to Tibet. Petech II, CL 72, pp. 103-104. Petech II, CL 72, p. 88; ibid. Orazio della Penna, CL 74, p. 129. The Chamberlain had advised them not to bring gifts in order to avoid giving rise to renewed speculation, saying that the “King” was still well-disposed towards them. Cf. Petech II, CL 79, p. 143; CL 83, p. 153. Detailed descriptions in Petech II, CL 83, pp. 153-155 and Petech III, CR 9, pp. 241-244. Petech III, CR 9, p. 240 describes in detail the parleys with the Regent’s Chamberlain in which theological issues were among those discussed. However, this portrayal is at odds with the reports in CL 79 and CL 83, in which a more benevolent manner is imputed to the Chamberlain. Petech II, CL 72, p. 90 and Guiseppe Maria da Gargano, CL 83, pp. 152-153; Gioacchino da S. Anatolia, in Petech III, CR 9, p. 243. According to Petech III, CR 9, p. 244 either the translation of Nicolas Turlot: Thesaurus doctrinae christianae or, according to Petech II, CL 79 of the book L´obbligo che ha ciascuno inserto nella natura di riconoscere la prima causa e di osservare i precetti della natura per rendersi abile e capace di ricevere la grazia per abbracciar la vera legge. Petech III, CR 9, pp. 244-245. Petech III, CR 9, pp. 245-246. Petech III, CR 9, pp. 246-248, gives a detailed description of the audience, but above all also of the text of the petition. Orazio in Petech II, CL 79, pp. 143-144. Orazio in Petech III, CR 9, p. 248. Memorie istoriche 1767, p. 33 (Petech III, CR 12, p. 284). Although not an eye-witness, he would have gained his information first-hand from Giuseppe Maria and/or Tranquillo d'Apecchio during their stay in Nepal. Most probably this letter contained a semi-official message by Belluga. He wrote to the Dalai Lama saying that if the Dalai Lama would embrace the Christian faith, he would not lose his dignity and position, but rather his prestige and personal status would be greatly enhanced by being elected Archbishop of Lhasa and Primate of the noble kingdom of Tibet. Whether any answer was given to this unbelievable proposal is unknown. According to Petech I, p. 186, n. 66, this message of Belluga is only preserved in the Spanish translation of Orazio della Penna’s Rappresentanza from 1738: Representacion hecha por el r. Procurador general de los religiosos menores capuchinos a la sagrada congregaacion de Propaganda Fide sobre el estado actual de la mission del Thibet, traducida del toscano por el doctor d. Antonio Maria Herrera, Madrid 1744, p. 102-103. Cardinal Luis Belluga had supported the Capuchins with money and even ordered and sponsored the printing press with Tibetan typefaces, which the Capuchins brought with them when returning to Lhasa in 1741. See Lenhart 1950, pp. 69-72. Memorie istoriche 1767, p. 33 (Petech III, CR 12, p. 284). In Petech II, CL 87, pp. 166-169. Memorie storiche 1767, p. 36 (Petech III, CR 12, p. 286). Memorie istoriche 1767, p. 36 (Petech III, CR 12, p. 286). Tranquillo d’Apecchio, in Petech II, CL 87, pp. 166-167. The Tibetans were purported to have been false, as if they had deceived the Capuchins from the beginning. See Costatino da Loro, in Petech II, CL 78, p. 140. Christian religion was slandered and said to be even worse than the Mohammedan religion which they held in great contempt. “… e ciò fecero per ismentire le calunnie che an­davano spargando fra’ secolari i Religiosi Thibettani contro la nostra sante Fede, declamandola peggiore della Maomettana, di cui ne hanno il giusto aborrimento.” Memorie istoriche 1767, p. 33. (Petech III, CR 12, p. 284). Gioacchino da S. Anatolia, in Petech III, CR 9, p. 243. Tranquillo d’Apecchio, in Petech II, CL 87, p. 168. For the Capuchins, it was clear who bore the responsibility for these events: “il Gran Lama, il Lama di Gigazè ed i lami tutti di Brebò, Serrà e Caden principali e popolatissimi conventi di tutto il Tibet, non volevano noi assolutamente nel detto Tibet,” Tranquillo d’Apecchio, in Petech II, CL 87, pp. 166-169. And even today the authors of “Fratri Cappuccini” 2003, seem to recognize the reasons for the failure only partly and blame Luciano Petech for his supposed contradictions and sympathies with Desideri. The charge was that the Capuchins had buried some rolls of the Kanjur under the thresholds of the main entrance doors to the hospice, so that they were trampled by all those passing through. Cf. Memorie istoriche 1767, p. 45 (Petech III, CR 12, pp. 288-289). In Memorie istoriche 1767, p. 45, (Petech III, CR 12, p. 289), Cassiano attempted at least partly to rehabilitate Pho lha nas: “che nel fondo del suo cuore non era totalmente contrario a' Missionarij.” Another view can be seen in a letter of Tranquillo from 24 October 1746 in Petech II, CL 87, p. 169, in which he assumes that after the “King’s” death it will be easier to return to Lhasa. However, cf. for example Barnett 1998 on present-day evangelical missionaries in Lhasa. In a letter to the Asiatic Society of Bengal, 1847, Brian Hodgson lists the donation of 47 books originally from the Capuchins, which he got from the young 11th Dalai Lama and wanted to present to Pope Pius IX, pp. 1250-1252. Edmund Candler 1905, p. 3, n., was the first to report, that he had seen the bell: “When in Lhasa I sought in vain for any trace of these buildings [of the Capuchins]. The most enlightened Tibetans are ignorant, or pretend to be so, that Christian missionaries have resided in the City. In the cathedral however, we found a bell with the inscription, ‘TE DEUM LAUDAMUS,’ which is probably a relic of the Capuchins.” See also Bell 1931, p. 152; Sís & Vanis 1956, p. 156; Richardson 1998, p. 250: “Ye-shu’i cong-chen-po.” After the cultural revolution it was first discovered by Silvano Garello in 1987 (cf. his La Campana Ferita. Vicenza1987, to which I didn’t have access) after being missed since long, lying in a storeroom in the Jo-khang. See here the photo of André Alexander, the bell having found in 1996. A bell 70 “libbre,” Gioacchino da S. Anatolia, in Petech II, CL 59, p. 4. This is claimed several times by Elio Marini in “Fratri Cappuccini” 2003, pp. 76, 83. Cassioano da Macerata, Giornale in Petech, IV, p. 57, lists in detail the 24 loads, which had to be transported from Kathmandu to the Tibetan border. cf. For example Hamilton 1819, p. 232: “The bells of Tibet are superior to those of Nepal.” And Kirkpatrick 1811, p. 210 “… and among the bells they [Newaris] construct for the use of their temples and other religious purpose, some are of a considerable size; one at Batgaon in particular being five feet in diameter.” For the present situation cf. Erberto Lobue 2002, p. 130; Ronge, 1980, pp. 269-276. It is also hard to believe, as claimed in 2003 by Egidio Picucci, (La Campana di Lhasa, www.fraticappuccini.it/pubblicazioni/archivio/tibet.shtml) and in “Agenzia Fides” (Palazzo di Propaganda Fide, Vaticano 4/6/2003) that it is that bell, which Marco della Tomba received from a British admiral in Chandanagore much later in 1757 as this bell had the weight of 1900 “libbre” and was then transported to the Capuchins’ hospice in Calcutta, (cf. Terzorio IX 1935, p. 58-59). On the further processes which led to a negative opinion of everything foreign and to a total isolation and encapsulation see Engelhardt 2002. No author given, however, Luciano Petech informed me he was the author in a letter dated 3 September, 1997. (Frankfurt: Eichborn, 1990): 91-105. Isrun Engelhardt, “Between Tolerance and Dogmatism: Tibetan Reactions to the Capuchin Missionaries in Lhasa, 1707-1745.” In: Zentralasiatische Studien (ZAS) 34 (2005), 55-97. Header image: Illustrations on the right side from Tibetan Catechism by Edward Amundsen, Christian Tract and Book Society, Calcutta 1906.